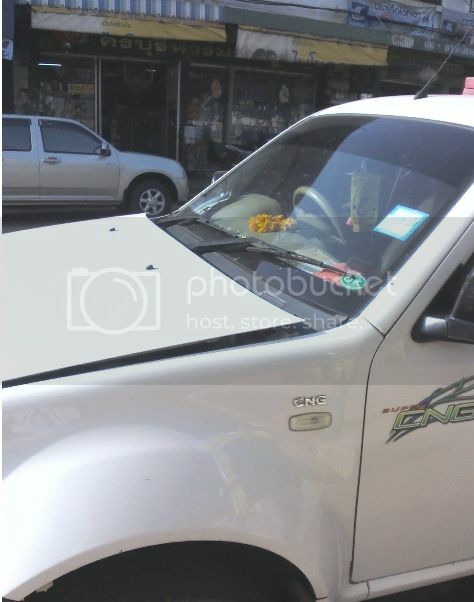 Ive noticed this trend going on in Pattaya , now I have no idea why , but I now see many pickups with their bonnets raised up at the rear as shown in the photo, I asked a mate what he thought and he said its some thing to do with the air conditioning , but I’m not convinced . I'm impressed that you called it a bonnet. Many are starting to call them a hood, American style. As long as I live ,on a car it will always be a bonnet and boot. Not a hood and a trunk. Last edited by Tingtong; 7th March 2017 at 08:28. Same with the engine cover on the rear of buses they seem to think they'll run cooler with them open... Which I doubt would make any difference. Rock behind wheel instead of applying or trusting park brake the other ones. We would always do it when I was younger it was because we had high rise in take manifolds and it raised the carbys hence the bonnet would need lifting. However I don't think that is the case with that car as it is fuel injected and has a air box at the front. Completely different set up. I can say it has nothing to do with the air conditioner. Gazmac, OZZYGUY, Tingtong and 1 others like this. Could there be a rice cooker under the bonnet operating off engine temperature? Bonnet up enough to let steam out? wabbits, Zablive, OZZYGUY and 1 others like this. Nah, you all got it wrong. It's a windscreen de-icing mod. Hot air from the engine bay melts snow or ice. You can cook a pot roast by this method on a long drive.